It gives you flexibility to quickly set up a blog, public website, corporate intranet or customer extranet. How To Get It The easiest way to get your own copy running is to sign up for an on-demand version at www.sauropol.com. Or, in case you prefer to install it in your own PC or Linux server, grab an installation package from www.saurus.info/downloads. Both options have free and commercial versions available. Who Are Using It The software runs near 1000 mission critical web sites including governments, banks, airlines, universities etc. Join The Developer Network We have put a great emphasis on developing and supporting our developer network. In our website you will find user manuals, API-documentation and real-life samples about customising and extending the product functionality. Joining the partner network is free of charge plus you’ll get one commercial license free for your own website. You cannot download any crack or serial number for Saurus CMS on this page. Every software that you are able to download on our site is legal. There is no crack, serial number, hack or activation key for Saurus CMS present here. Our collection also doesn't contain any keygens, because keygen programs are being used in illegal ways which we do not support. All software that you can find here is freely downloadable and legal. Saurus CMS installation package is prepared to be downloaded from our fast download servers. It is checked for possible viruses and is proven to be 100% clean and safe. Various leading antiviruses have been used to test Saurus CMS, if it contains any viruses. No infections have been found and downloading Saurus CMS is completelly problem free because of that reason. Our experts on malware detection tested Saurus CMS with various spyware and malware detection programs, including fyxm.net custom malware and spyware detection, and absolutelly no malware or spyware was found in Saurus CMS. All software that you can find on our servers, including Saurus CMS, is either freeware, shareware or open-source, some of the software packages are demo, trial or patch versions and if possible (public domain licence), we also host official full versions of software. Because we want to be one of the fastest download sites on the web, we host all the software including Saurus CMS on our servers. You cannot find here any torrents or download links that would lead you to dangerous sites. 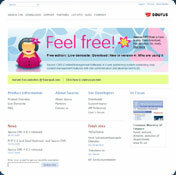 Rate Saurus CMS 4.6.1 Beta / 4.5.7!